Your sautés for two to three people will be packed with flavour when you put our 20cm bimetal sauté pan to the test. High straight sides regulate moisture while the solid copper conducts heat superbly. Shake up your routine with our 20cm copper sauté pan. 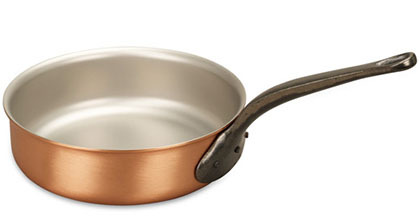 I love Falk copper pans. I've used most of the other famous brands (le creuset, Woll, All Clad etc. ), but Falk comes out on top. This sauté pan is so useful - making one pot single meals, reducing sauces, making emulsion sauces to name a few. It's so versatile and like all Falk products is top quality and beautiful to look at. 442 customers found this review helpful. Did you? Yes, I did! 493 customers found this review helpful. Did you? Yes, I did!